Our video this week is another great fan-created tribute to and re-imagining of Timothy’s crazy Cajun dance from Bayou (1957). The video was created and the music composed by Bob Moricz, a humongously talented underground filmmaker out of Sacramento, CA. Says Bob about Tim, “He was one of those people who just kept popping up in my favorite movies and what a wild wild man. I learned so much about him on your website. It seems the more I find out about him, the stranger he gets. A true one of a kind and those are my favorites. Your website is a treasure trove. Thanks for all the hard work you put into it.” Thank you, Bob, and thank you so much for this wonderful video! 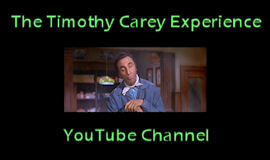 This entry was posted in Film, Music, Quotes, Video and tagged bayou, bob moricz, timothy carey. Bookmark the permalink.